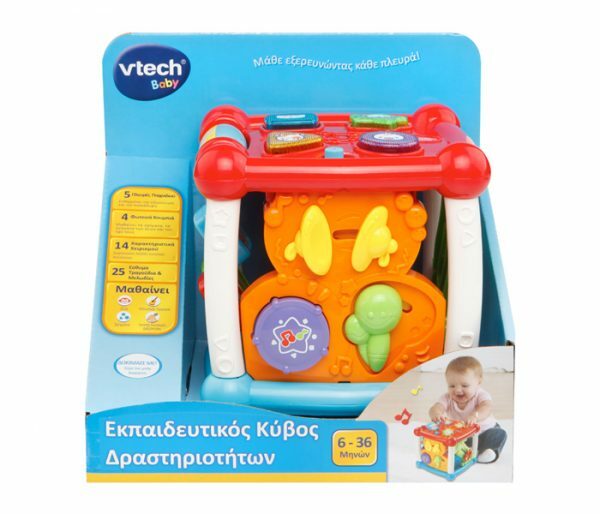 With this Greek language VTech training cube, your child will learn quickly, easily and at the same time be entertained. With 5 sides for exploration, this cube attracts your baby’s attention through music, large bright buttons, intense coloring and more! Light up buttons introduce the child to animals, their sounds and much more. Press or drag the musical instruments to hear their name in Greek and sound. Plays 5 songs in Greek to sing with your child and 20 entertaining melodies. It encourages the development of motor skills, the imaginative game of linguistic and audiovisual development.